Who qualifies for bin exemption? 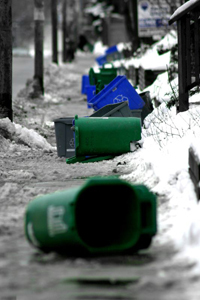 Finally, there is recognition by City Hall that some residents have no storage space and cannot accommodate any size of bin: “In some extremely problematic situations, residents may require a bag system for collection“, quoting Ward 28 Councillor McConnell’s March 7 newsletter. Not surprising, considering the many compact houses that can found throughout Riverdale, Cabbagetown, Trefann Court, Chinatown and other downtown neighbourhoods. a garage at the front of the property which is sufficient in size to accommodate the Carts without removing the car. 2) If desired, a property is exempted if there are stairs, on the route from the Cart storage area to the street curb, such that the Carts cannot be easily wheeled. Such written criteria would provide all residents with the same guidelines to follow, and reassure residents that the City is not imposing an unrealistic amount of extra hardship on some residents, to accommodate these bins. But the city won’t share its criteria, opting instead for an expensive and subjective process: requiring that a City Solid Waste employee representative conduct a site visit for every resident requesting an exception to the bins. Toronto is implementing a “user pay” system for waste management, so let’s demand a firm commitment from the Mayor that the annual increases in the fee for residential waste management will not exceed inflation. One Response to Who qualifies for bin exemption? Nice photo you have with the entry…I can see and understand fully now how the disposal guys will treat our new and improved bins, bags, blah blah with much more care and attention. Oh the fun of anticipation!